A 58 year old male referred to me in April, 2013 (by another physician). Symptoms were of 18 months duration. He felt well until one night he awoke with bilateral cervical and pain in both upper extremities. His LMD (local medical doctor) treated him with a course of NSAIDS which was ineffective. He was referred to rheumatologists who diagnosed a frozen shoulder syndrome and prescribed physical therapy which was initially beneficial. (the phrase LMD, although pejorative, is not as insulting as the appellation "provider"). Contemporaneously, he complained of severe fatigue, malaise, recurring shoulder pains and pains involving both legs. He developed pain and swelling in both wrists and ankles. A diagnostic work-up was pursued. Results of tests: thyroid functions normal; rheumatoid factor and CCP antibodies negative; ANA elevated titer 1:160, speckled pattern; RNP antibodies, Smith antibodies, Antiscleroderma-70 antibodies, Sjogren's SSA and SSB negative, Antichromatin antibodies negative, Anti-Jo antibodies negative, Anti-Centromere B antibodies, ANA-D negative, dsDNA negative, Chromatin negative, SSA, scl-7 9 antiDNA topoisomerase negative, Centromere B negative, Jo-1 and nRNP negative, HLA B27 negative, RPR negative, Vitamin D normal, CK normal, Aldolase elevated (normal up to 7.6, result 13.8, CRP elevated 29.9. I apologize for some tests I omitted. A test for Lyme disease showed an ELISA greater than 5, 10/10 IgG bands reactive and 2/3 IgM bands reactive. A diagnosis of Lyme disease was made and the patient was treated with a three week course of doxycycline, 100 mg twice daily for 21 days. This was not helpful. An EMG was consistent with a muscle disorder. A muscle biopsy was performed at a major University Hospital. The report read: "Inflammatory myopathy, nonspecific." "This pattern can be seen in dermatomyositis,...other systemic rheumatological disorders such as lupus or rheumatoid arthritis. Clinical correlation is essential." The patient was treated by his rheumatologist with systemic steroids for several months without improvement. The Aldolase level (muscle enzyme) was unchanged. The patient was seen by me 5 months ago, after more than one year of diagnosis and treatment from a major University setting, without benefit. Further laboratory testing per me was remarkable for a C6 peptide greater than the assay is able to measure. I diagnosed primary Lyme myositis, a relatively rare condition in my experience. Moderately aggressive therapy was initialed with a combination of oral antibiotics. After 8 weeks the patient was feeling much improved. The pain and swelling were gone. Fatigue was minimal and he complained only of mild stiffness. After 8 weeks, aldolase ( a muscle enzyme) was in the normal range, 4.8. The CK remained normal. The ANA was entirely negative, slightly elevated before. The CRP was reduced from about 30 to 3.25(almost normal). He was last seen at the end of September, 2013. He indicated that he felt essentially normal, especially over the past 3 weeks except for mild muscle stiffness. He denied any constitutional, other musculoskeletal or neurological symptoms and was back to his normal activities. Repeat Lyme antibodies and C6 peptide are pending, ordered for academic purposes. Repeat Laboratory testing showed a normal CRP. Note: A group of rheumatologists did an exhaustive workup covering the academic waterfront for every known rheumatologic disease. The pathology report supported this approach. The patient had been appropriatelytreated for Lyme disease according to the IDSA guidelines adopted by the American Rheumatological Societies. Therefore, although the diagnosis was not clear and the patient had not responded to appropriate therapy; it was clear the answer was not chronic Lyme disease; a disease which does not exist as supported by experts in the fields of rheumatology, neurology, infectious diseases and evidenced based medicine based on peer reviewed studies published in the most prestigious journals. 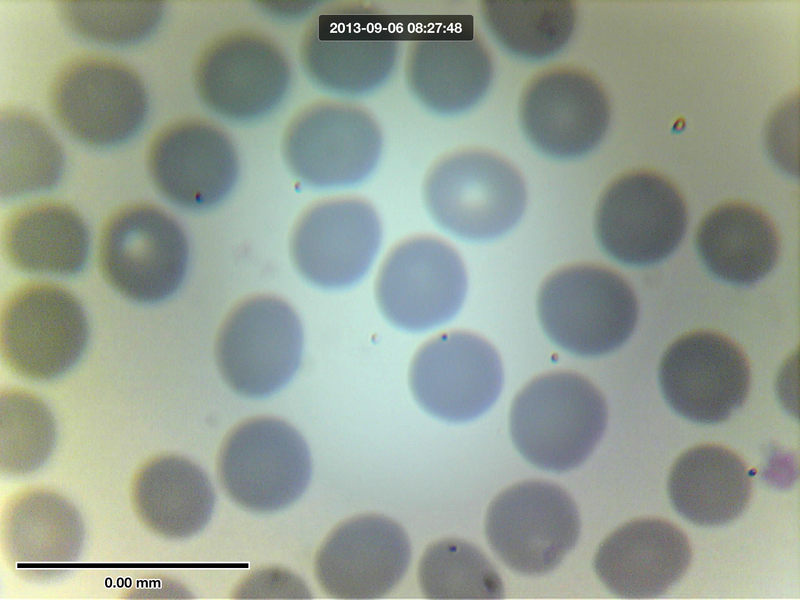 I am presenting a series of images from blood smears from my in house lab. I find this to be a truly remarkable image. I have treated this patient for severe, relenting disease for a period of two years. She is on a second round of IV antibiotics. Progress has been slow. Night sweats, nightly fevers, air hunger, headaches and muscle pain have been prominent, persisting symptoms. She consistently tested negative for B. microti and B. duncani until recently. She now has a high titer of antibodies for WA1 or Babesia duncani after numerous rounds of anti-malaria therapies. I am not sure she has B. duncani. I think she may be infected with a cross-reacting species. This sero-conversion as more commonly seen in Lyme Western Blots. She has failed every regimen for Babesia. This smear was obtained which she is on IV clindamycin and quinine (which she tolerates well). 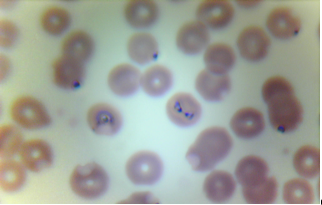 This smear shows a typical Babesia "bowtie." This image was obtained from a fresh smear stained with Wright Giemsa. Blood smear images from our office lab. 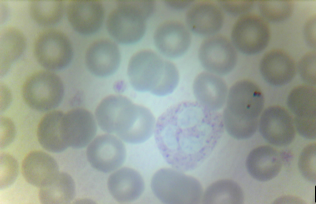 This Giemsa blood smear shows typical Bartonella-like bacteria. 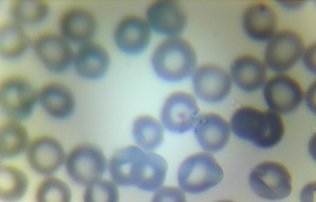 These are seen as small dots which color blue at the edges or just inside the red blood cells. These are larger than a Bartonella-like organism shown below in a different images. There are many species of Bartonella-like bacteria of differing sizes. These smears are an adjunct in the diagnosis of patients with tick borne illness. We are not able to speciate, (indicate a specific species) and antibody tests and PCR DNA tests are negative. We call these bacteria Bartonella-like but they really fall within the realm of mystery bugs. Blood smears from my office lab reported as part of a series. This image from one of my patients shows indeterminate findings. Parasitic organisms are seen within a red blood cell. Bartonella is frequently seen at the edge of red blood cells but is also found inside cells. These organisms are too large for typical Bartonella -- although there is a lot of variability in the size of differing species. 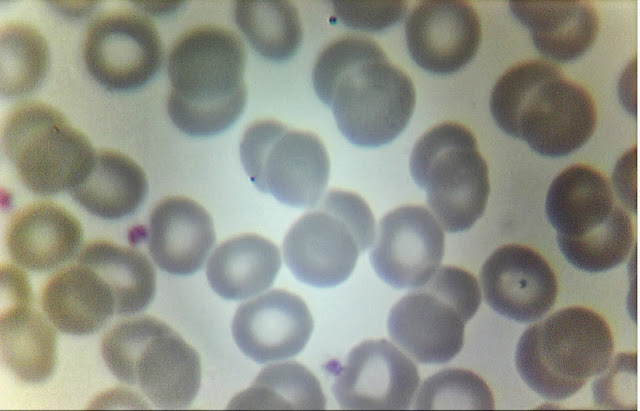 These organisms cannot be identified as Babesia since they lack clear diagnostic characteristics. For now I have to classify these findings under "mystery bugs." 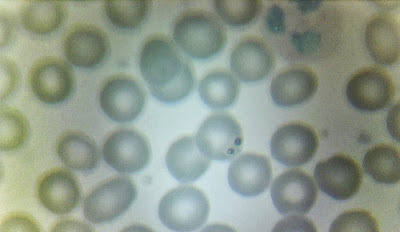 These images are from my office lab which now performs in house, diagnostic blood smear examinations for our patients. All of these images come from patients with negative serological blood test results. This a Giemsa stain from my office lab. The tiny dot at the bottom of the slide is typical of Bartonella-like organisms. These are typically very small. The bacteria stains dark blue. 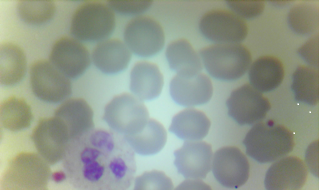 Note, the larger purplish splotch indenting a red blood cell comes from platelets. The larger cell is a typical white blood cell called by various names, including: neutrophil, poly, granulocyte. Blood smears are a great addition to the evaluation of patients with Lyme disease. The smears must be performed within an hour of drawing the blood. I now include this procedure in my office as a routine part of the evaluation of my patients. My next blogs will highlight a series of my blood smear results. An 18 year old female presents with a complete inability to function. She suffers with severe, unrelenting fatigue, migratory joint pains of both small and large joints, brain fog -- and when asked: recurring flu-like symptoms, low grade fevers, severe night sweats and air hunger. She has a longstanding history of learning disabilities as well as ADD and depression. At age 5 she had a "spider bite" associated with a rash. In addition, her mother, a lifelong avid gardener, with a history of severe Lyme disease was likely infected during her pregnancy with my patient. Her laboratory work was "CDC positive" for Lyme. Serological tests for B. microti and B. duncani were both negative. This Giemsa blood smear shows typical findings of Babesia, confirming the clinical impression. 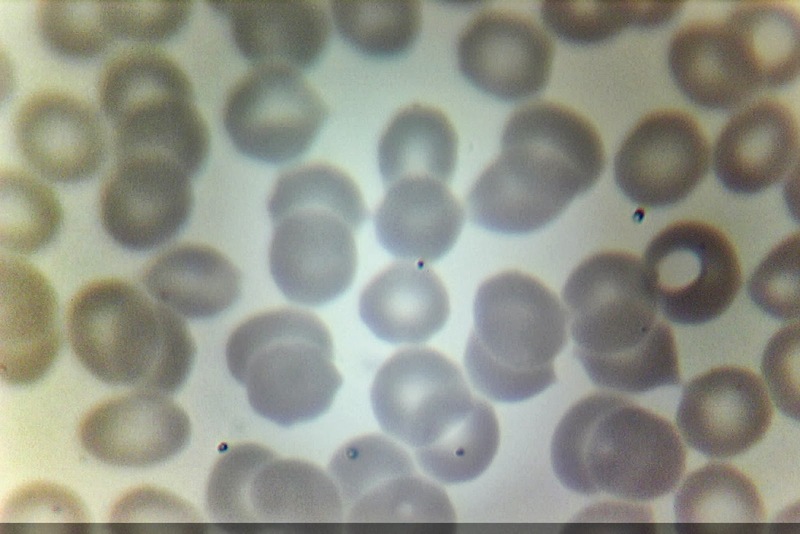 There are numerous species of Babesia which cause human disease, some known and others unknown. It is not possible to "speciate" these findings. This patient is from Georgia. He used to a lot of outdoor work in his garden. He was also a frequent hiker on the Appalachian. He had a long history of tick bites which he thought were inconsequential. In 2007 he developed disabling pains of his arms and legs to the point that he was unable to walk. He saw a neurologist who performed various tests. An EMG showed a severe polyneuropathy, motor and sensory. He experienced numbness and tingling. He experienced difficulty swallowing; episodes during which he was unable to speak and episodes of muscle paralysis. His muscles would suddenly go into acute spasms associated with myoclonic jerking and fasciculations. He went on to develop a host of other symptoms. Some of these included: emotional labiality, a loss of balance, unremitting tinnitus, extreme sensitivity to both light and sound. His skin became extremely sensitive to touch and he experienced a heightened sense of pain whenever his skin touched something. In fact, he has not had a repeat EMG because of intolerable pain. He saw a variety of neurologist who ordered a multiplicity of other tests including MRI scans and EEGS which were of no benefit. After some time, he was not longer to walk progressing from cane to wheelchair. Joint pain became prominent. He experienced pain and swelling in all his small joints, medium joints and large joints. He also developed pain in his cervical and lumbar spine areas. On further questioning symptoms now include: fatigue, night sweats, air hunger, brain fog, trouble articulating words, forgetfulness, inattention, drooping of one side of his face among many others. Doctors claim there is no Lyme in Georgia. Let me take a step back. In 2009 his wife suspected he had Lyme disease. She was able to find a doctor who, over a course of years, treated him with antimicrobials including: Minocin, Zithromax, Flagyl and Malarone. The treatment was somewhat effective. The same symptoms were present but had lessened, maybe 30%. Six months ago a new doctor, taking the place of the previous one refused to prescribe any more antibiotics. Over this period of time symptoms worsened dramatically. When he saw me there was a desperation to find a doctor who would continue to prescribe medications. The diagnosis of Lyme disease had been empiric. Lab tests had always been negative. When I examined him he appeared chronically ill. Most notable, when I asked him to squeeze my hands to test his strength -- always a part of my exam -- his hands became locked in a spasm with every increasing pressure applied to my hands. My hands were stuck and beginning to hurt. I did not know this is possible. I had to call my assistant to help pry open his fingers so I could remove mine. He had never been treated with IV antibiotics and I felt this should be tried right out of the gate. So I ordered some lab tests. A Lyme WB from Stony Brook found only a 64 IgM band and a 58 IgG band. This was frustrating. A WB sent to IgeneX found only a 58 IgM band and a 41 IgG band. I hit pay dirt with labs sent to Labcorp. The C6 peptide ELISA was 1.34 -- clearly positive for Lyme. In addition, serology for Rocky Mountain Spotted Fever was also positive. My initial impressions included: Lyme, Babesia, Rickettsia organism. I ordered: Rocephin, Doxycycline, IVIG, Tindamax and Coartem. I saw him at follow-up a month later. He had only taken the doxy, Tindamax and Coartem. The IV Rocephin and IVIG had not been approved. Nonetheless, he reported feeling significantly better. Surprisingly better. Another test showed an immune deficiency. His total IgG, and subclasses 1 and 3 were low as was his IgM. I diagnosed CIDP clinically. He had pain, weakness, marked sensory/ motor abnormalities and absent deep tendon reflexes. The neurologists would not consider the diagnosis without another EMG which he is unable to have. Of note, he has a complete absence of reflexes: this is something neurologist love to see to make this diagnosis. If his local doctors were not buying the CIDP diagnosis there was clear evidence of an immunoglobulin deficiency typical of Common Variable Immunodeficiency Syndrome. This diagnosis was also not made back home. Generally with this diagnosis it is possible to have subcutaneous Ig approved. He has now had two sessions in my hyperbaric chamber. He is doing surprisingly well. This case underscores the importance of treating clinical babesiosis. In this case I went straight for the big gun: Coartem. This seems to have paid off. The positive test for RMSF might reflex some cross-reacting Rickettsia, less virulent than RMSF. He had never been prescribed doxycycline previously. The addition of this medicine may have been important. Don't forget to take doxy at some point during therapy. I am hoping hyperbaric oxygen therapy will do for him what I thought IVIG would. A key lesson in this case is: don't forget to order the C6 peptide. Certain posts consistently have a lot of page views. This includes 2010: a brief update. I don't agree with my 2010-self in many ways. Here is another update. The diagnosis of Lyme disease remains clinical. The primary test for Lyme disease is the Western Blot, (WB). An ELISA may be ordered (as a separate test) as long as it is not “reflexed” to a Western Blot. The C6 peptide ELISA is always ordered, but not interpreted according to Immunetics criteria. Western Blots are generally sent to one of several reference laboratories. I currently prefer Stony Brook because they take insurance and their assay includes many additional bands. Frequently, WBs are sent to two reference labs. I do not order a lot of immunological tests like C4a because I have not found these tests to be clinically useful. A typical coinfection panel includes serology for: Ehrlichia, Anaplasma, Bartonella, Babesia microti, Babesia duncani (still frequently called WA1). I may include Rocky Mountain Spotted Fever as well as a few others. Positive results are very helpful but negative results are neutral and do not exclude the presence of disease. A thin stained blood smear should be considered in the workup because Bartonella-like and Babesia-like organisms may be seen. More advanced microscopic tests may be performed but are not standard. Immuno-florescent microscopy. e.g. FISH) may be helpful in some cases. Blood cultures may be very useful. The test is costly and positive result requires a PCR for confirmation. PCR testing may be done with cord blood to exclude placental transmission to a new born baby. PCR should be used with non-blood body fluids such as joint and spinal fluids. Antibodies should also be measured, i.e. WB, C6 peptide. For the treatment of resistant Babesia, Coartem should be used rather than Larium as the next step. I generally avoid quinolones such as Levaquin and Factive because of tendon toxicity. Bartonella species may become rapidly resistant to quinolones: Biaxin/doxycycline/Bactrim/Cleocin in combination with Rifampin is a better approach. Rifampin should never be used alone because of the rapid onset of resistance. I left Zithromax off the list, which I still frequently prescribe, because it may have greater cardio-toxicity. A wide spectrum of intravenous antibiotics may be used. Rocephin and Flagyl remain very important. Biofilms formation is an effective strategy for long term survival of microbes. This segues into hyperbaric oxygen therapy which disperse biofilms. I have written about its effectiveness and usefulness elsewhere. I try to incorporate Hyperbaric oxygen therapy, HBOT, when feasible, especially in tough cases. IVIG may be incredibly helpful but is usually only be approved for certain types of neuropathy. A skin biopsy sent to Therapath, looking for small fiber neuropathy is now an important part of my practice. An evaluation of immunoglobulins, including IgG subclasses has become part of the typical workup. Deficiencies are very common. Sometimes a patient doesn't see it when it is so obvious to others. That's the way it can be with slow and steady progress. I have known this patient for 7 years. When I first met her she was on death's door. Her prior doctor had given up and told her there was simply nothing else he could do. I treated her for a time. There were some ups and downs with one life-threatening event. I certainly hadn't given up -- but one day she was gone. Like many other critically ill patients, who never give up and whose disease is relentless, she had made the rounds. She had seen three other well known doctors who had been unable to help her. Then she completed the circle and made another appointment in my office. She walked through my office doors about 4 months ago for the first time in as many years. She was in a wheelchair: unable to walk because of weakness. Communications were difficult in part because of strange, what I call, chorea-form like, jerking movements about her face, head and neck. Like many other Lyme patients she exhibited strange, uncontrolled, body movements outside the realm of standard medical diagnostic groups. Other physicians invariably diagnose a psychological basis for the movements. But that was not the only reason communication was difficult. Her speech was severely slurred (dysarthric); she lacked adequate muscle control of muscles of her tongue and mouth making it impossible to enunciate clearly. To make matters worse, she was severely cognitively impaired. She lacked the ability to put words together in proper sentences. This is what we call aphasia. Her thoughts were scattered and very difficult to make heads or tails of. She looked sicker than I remember the last time I saw her. When I see patients like her, now, I go down the short list of aggressive therapies which might help. First there is IV antibiotics. She had been on numerous drugs for many months without much improvement. Then I think immunotherapy. Getting it approved is the trick. Lyme is a multisystem disease. It is also a multisystem, within a system disease. When it affects the nervous system it generally effects multiple components. The nervous system is extraordinarily complex, but following the KISS, principle, for the patient and myself, (Keep It Simple Stupid) I break down the nervous system into a few basic components. The central nervous system consisting of the brain and spinal cord. The cranial nerves, a dozen nerves branching directly from the brain. And the peripheral nerves: everything that branches off from the spinal cord, including motor, sensory and autonomic parts. The brain being the preeminent piece of the central nervous system (CNS) can be assessed with MRIs, PETs, SPECTs, other imaging modalities and paper and pencil tests. The autonomic nervous system is best assessed with a tilt table test looking for POTS. The peripheral nervous system has traditionally been evaluated by electrical testing, (NCV/EMG). But now I have another modality. Her EMG test was normal but I still thought she had a problem with her peripheral nerves. I performed a skin, sweat biopsy test which looks for something called small fiber neuropathy. The lab sent us a report saying it was essentially the worse looking SFN they had seen. Bingo. Her insurance company approved her for IViG, the best immunotherapy available. Insurance companies will only approve the $10,000.00 dollar every three week treatment if you can convince them you have one of a limited number of progressive peripheral nerve disorders. This is not an easy feat. The third item on my short list was HBOT, Hyperbaric oxygen therapy. I have written some about HBOT already and so far I am very impressed. Now her treatment consists of 1) antibiotics, 2) IViG and 3) HBOT. Today she walked into my office under her own power. Her speech was clear and easy to understand. Her eyes were clear and her thoughts were completely cogent. This is not to say she does not have some other, very serious problems which we are working on, and expect to continue working on for a long time to come. Today, she really didn't get it. She had no clue how far she has come. Her transformation is beyond words, so far. Incidentally, we doctors are all used to patients trying other physicians. I would if I were you. We expect this. You should never feel embarrassed going back to a previous doctor. The doctor is (usually) happy to see you back. We doctors do things differently. Sometimes one will have more success than another. Patients frequently ask me about "detoxing." As an allopathic physician I have generally scratched my chin and have had little to offer. The first question is: what are toxins; where do they come from? Let's face it. Our world in many ways can be described as a toxic soup. Most toxins come from things we eat. We are constantly barraged by a host of chemicals: insecticides, pesticides, mycotoxins, biotoxins, industrial waste, heavy metals, ingredients on food labels we can't read, genetically modified foods etc... Our air is so toxic that oxygen bars exist in some countries. We know that many of these toxins are poisonous and many have the ability to cause cancer. Some fat soluble toxins will never be removed. It is not surprising that patients want to be detoxed -- especially when they are chronically ill. The first common sense thing is to limit intake of toxins as much as possible. This means spending a lot of money on organic foods. It is hard to get away from polluted air outside. But we can frequently remedy indoor sources of toxins, such as toxic mold. If we keep ingesting toxins there is no point in detoxing. We have two organs which are incredibly effective in eliminating toxins: liver and kidneys. First and foremost, we should do everything possible to protect these vital organs. The three most common causes of kidney failure are: diabetes, hypertension/atherosclerosis and chronic use of pain medicines such as Tylenol. These issues should be taken seriously -- a discussion of which is outside this blog. We frequently abuse our liver with alcohol. We can also damage our liver when we take multiple drugs that require the same enzyme for detoxification. Your doctor/pharmacist should always check for drug interactions. We need to be careful when we take medicines that are known to be toxic to the liver. For example, the use of statin drugs for cholesterol many be toxic to liver and muscles. These drugs may be medically necessary; patients and their doctors should consider all factors on a case-by-case basis. We need to make sure we intake adequate amounts of minerals. For example, selenium is required for function of our most important antioxidant, glutathione. Glutathione is an essential antioxidant and detoxifying compound found within our cells. Glutathione levels decrease with age and can be depleted in the chronically ill. Many patients get IV glutathione in doctors offices which appears to be beneficial, but the effects are short-lived. Glutathione is not absorbed when taken orally. However, liposomal glutathione is available and has good oral adsorption. In the world of alternative medicine many supplements are recommended to help with detoxification. Some include: SAMe, flavonoids, green tea extract, various fruits and vegetables, milk thistle and many others. There are too many to list. Some tout the benefits of burbur. This is outside my scope of practice, but I believe some of these therapies are helpful. Coffee. Some people use coffee enemas. I don't like the sounds of it. There is evidence that coffee has clear liver protecting properties but I prefer to take mine by mouth. Probiotics and gut flora are important. Toxins may be removed in the colon. Regular bowel movements are important. Chronic constipation should be avoided. An adequate fiber intake is key. Some people think that chelation is helpful. This therapy removes heavy metals. There are a number of ways of accomplishing this with IV and oral therapies. This is a particularly controversial topic: one I wish to skirt around. Quinolinic acid is a very important neurotoxin. My best bet has been to remove it from bile and excrete it though the gut with medicines like cholestyramine or Welchol. Quinolinic acid is associated with glutamate modulated excito-toxicity. The drug Namenda, used for Alzheimer's disease, may help mitigate this effect. Other strategies are emerging. My common sense approach regarding diet is to look at societies with the healthiest people and the highest per capita rates of residents over 100 years of age. This occurs on a Japanese island and a Greek island. Both have a low intake of meat and fish/seafood is the primary source of animal protein. The primary starch is either potatoes and coarse bread or rice. The diets incorporate fresh greens and legumes: chick peas and lentils in one case and soybeans in the other. Cow's milk is not used in these diets. However, goat milk products, including yogurt and cheese are used in the Greek diet. The composition of goat milk is similar to human milk. Sugar is not used, but honey is part of the diet. The Japanese exercise vigorously: the Greeks have no formal exercise but walk up steep hills and sometimes dance. The Greek diet incorporates fresh olives and olive oil. Both drink teas (and coffee). Some consume moderate amounts of alcohol. Artificial beverages and sweeteners are not used: the same is true for sugary/fructose syrup, American style beverages. Both groups live on an island with perfect weather and are happier than we are. Incidentally, women live longer on Okinawa and men live longer in an island in Greece. There are some treatments I am sure do not work. The most notorious is foot detox. Here feet are bathed in an electrolyte solution and a gentle current is applied. The water turns brown and pieces of metal show up; the patient is told he/she has been detoxed. It turns out that the process causes oxidation and electrolysis of the metals in the electrodes. The exact same effect is seen when no feet are placed in the bath. "And now for my next magical trick...." On the other hand, I am sure that foot baths are very soothing and promote relaxation; just don't shell out bucks for one. Biofilms have long been a concern for Lyme patients. One reason for persistence of infections, including Lyme disease is the existence of Biofilms. It should be known that this is nothing unique to Lyme. Other pathogenic bacteria, for example, pseudomonas are known to exist within biofilms. Bacteria in biofilms are reported to be up to 1000X more resistant to the effects of antibiotics than free floating bacteria. Free swimming bacteria are called planktonic which distinguishes them from bacteria contained within a biofilm. Biofilms are composed of colonies of bacteria and protozoans that are protected by a mucopolysaccharide covering as well as bits of DNA and other molecules. Biofilms are not limited to one species. Numerous species can live within the same structure. Bacteria within biofilms somehow communicate by a process called quorum sensing. They communicate back and forth to "discuss" the best strategies for survival and expansion. The group as a whole develops a sort of "collective intelligence." There are many other examples in nature of a similar phenomenon, for example, the collective brilliance of an ant colony. Bacteria, the first life forms on the planet, have been around for 4.5 billion years and we have only been here for one hundred thousand or so. That may explain why bacteria through a very lengthy process of evolution, are so smart. Lyme bacteria within these structures are in a quiescent state of suspended animation. Every now and then, when conditions are ripe, a segment of the colony may break off to colonize another region, or release some bacteria in a planktonic (free swimming) state. One of the "Holy Grails" in Lyme therapy has been finding a way to break down biofilms. Herbs have been tried which use enzymes to break down protein (proteolytic). I am a skeptical since there is no likely no effective way of delivering the proteins to the targets -- and because they are targeting the wrong thing since biofilms are not primarily comprised of protein. Hyperbaric therapy, in addition to producing reactive oxygen species, also produces reactive nitrogen species. One of these products is nitric oxide. The effects of this compound are complex and protean with literature that goes on forever. But one demonstrated effect is the dispersal of biofilms. This may be of additional benefit. Lots of questions about my experience treating my patients with low pressure hyperbaric oxygen therapy. I have only been using this treatment for a few weeks. I have started all of my patients at a pressure of 1.3 ATA, breathing 100% oxygen. All patients have experienced Herxheimer reactions, of varying degrees. I am not yet seeing much clinical change in my sickest patients (who have completed two weeks). This is not surprising; but I hope to hear good things after a month or more. I am hearing good things from moderately ill patients already, and this is very exciting. Of course I cannot rule out the placebo effect. Some patients have reported significant improvements after only 4-10 treatments. Improvements include: rapid wound healing (not a surprise), less joint pain, more energy, less brain fog, less headaches and a greater overall sense of well-being. Changes in function ability have also been reported. One patient reports a tremendous increase in energy and endurance. A couple of patients have had rather severe Herxheimer reactions characterized by severe fatigue. In these cases I have lowered the frequency of therapy. My sense so far is that HBOT is like many other treatments: results are variable and treatment programs need to be adjusted. I suspect that therapy is going to be prolonged for most patients. I think a 3 day per week schedule will help but may take longer. Perhaps more time in the chamber will help. A lot of benefits have been described for low pressure HBOT. Currently I am using 1.3 atmospheric pressure which equates with swimming about 11 feet underwater. I have supplemental valves which will allow me to raise the pressure to 1.5 ATA, equal to swimming 18 feet underwater. I will try different pressures with patients to see what works best. 1.5 ATA is the upper limit of what is generally considered low pressure. There is an argument that low pressure is better than high. A primary mode of action of HBOT is the generation of reactive oxygen species. These compounds are oxidants, not anti-oxidants. At lower levels they reduce inflammation, kill bacteria and promote improved functioning of the immune system. It is possible that excessive amounts of these compounds may have a toxic effect. (I do not know if this is true; I have only read about it). Does low pressure HBOT work? I think so. Maybe I said this before. All elite athletes own and use HBOT units, finding better recovery from work outs with a lot less muscle pain. I hear some athletes even sleep in them; but the consensus is that this is likely not a good idea. Home chambers do not exceed 1.3 pressures based on current FDA allowances (which is being challenged). Doxycycline is the standard first line drug for Lyme disease. During the summer because of reactions to sunlight we frequently prescribe either amoxicillin or Ceftin. These drugs as mono-therapy are inherently problematic. They have no activity against a number of co-infections, such as Anaplasma, Ehrlichia, Bartonella and Babesia. Doxycycline may have a modest effect against both Bartonella and Babesia, particularly early on. There is another germ which I have underplayed and may be highly significant. Mycoplasma. Most Mycoplasma species are not tick borne but M. fermentans can be tick borne. Other common species of Mycoplasma include: M. pneumonia, M. penetrans, M. hominis. Most doctors are only familiar with M. pneumonia which is associated with "walking pneumonia." Another variant is associated with an STD. I am looking at a review article by Endresen. Evidence is presented that Mycoplasma is highly associated with chronic fatigue syndrome, fibromyalgia and Gulf War Syndrome. There is a trend in medical literature to claim that fibromyalgia and chronic fatigue syndrome are one and the same disease. Other papers has shown a clear relationship of Mycoplasma with inflammatory arthritis, including rheumatoid arthritis. (not mentioned here). He reports that patients with more than one species of Mycoplasma detected have disease of greater severity. It is interesting: he discusses Mycoplasma as a potential coinfection in patients with CFS/FMS and mentions: Chlamydia, brucella? enteric bacteria like Proteus? and various viruses. I think Brucellosis has been causing a chronic "Lyme-like" disease for decades before Lyme came on the scene. This is certainly not a mainstream view. Why couldn't he mention the "L word." Is it that much of a third rail for academic researchers? He even talks about treatment. He discusses the use of Minocin, Cipro, Biaxin, Zithromax but downplays the role of doxycycline. It seems this has something to do with a clinical trial sponsored by the US defense department study of veterans with Gulf War Syndrome treated with doxycycline for one year. We know that Garth Nicolson has strong views on the topic. The author believes that short courses of antibiotics are frequently associated with relapse and that one year of treatment may be required for recovery. Once again, long-term antibiotic therapy may be acceptable as long as it is not for Lyme. Mycoplasma should be considered a potentially significant player and I suspect that doxycycline works as well as minocycline and that antibiotics need to be used in combination for effective therapy. Deer ticks, Ixodes scapularis carry another Lyme like bacteria. It appears to be a nasty spirochete in the Lyme family. No test is currently available: Borrelia miyamoto. We have known about this germ since 2001. It caught the attention of health authorities: a study published in the New England Journal of Medicine reported 21% of 14 patients evaluated in a Lyme clinic in Southern New York, with only flu-like symptoms, tested positive. (We do not have the test yet). Some patients sero-converted. The opposite of STARI, which gives a bulls eye rash, this spirochete does not cause EM (Lyme rash) but presents with flu-like symptoms. It may cause cases of a sero-negative illness which may resemble chronic Lyme disease according to Dr. Brian Fallon as reported on CBC July 2, 2013. A test is only available to researchers and the CDC. Yes, as many have said all along, the diagnosis of Lyme disease is based primarily on clinical grounds, not laboratory data. What else don't we know? My 52 year patient felt she was a failure in life when she saw me 5 years ago. Before that (in her previous life) she was living the "American Dream." Gregarious, vivacious and outgoing - she was the life of the party. Barbecues on the deck were a regular occurrence. To escape the stress of daily life and raising three kids she was passionate about her hobby, gardening. She was frequently seen pruning and trimming her exquisite landscaping, the envy of all, late into the night. Then at age 44 she developed headaches, diagnosed as migraines. It seemed odd that migraines would suddenly appear in midlife -- and there was no family history of migraine. The headaches became more frequent and unbearable. They robbed her of all quality of life. She went to numerous doctors ultimately ending up in pain management taking narcotics which barely took the edge of her progressing misery. The parties stopped, as did the gardening. She could not work or help the kids with their homework. She had other symptoms too. She had drenching night sweats and trouble moving. It was an effort to move her legs to get out of bed in the morning. Her body hurt: her hands started swelling. She wasn't just tired. Words don't describe the crushing weariness she experienced. She just wasn't thinking as clearly as she used to. Her once sharp memory was now dull, and getting duller. She became depressed. Antidepressants offered little relief: at times she contemplated ending her life. What the hell was wrong with her she thought. A neighbor still gardened avidly and went to the PTA meetings. She had simply fallen to pieces. She thought she was weak, a failure and somehow it was her fault. Doctors pretty much told her as much. When she finally shared with me what had been going on I asked her if she knew anything about Lyme disease. She did not. Let my digress for a moment. Now that I "specialize" in Lyme I can no longer help others like her -- falling thorough the cracks or perhaps off the cliffs; caught in a medical system which is blind and deaf. Ultimately I convinced her to proceed with my recommended treatment for Lyme disease. It helped. But she never took the medications long enough because of side effects. Despite suboptimal therapy, sweats got better as did the brain fog. Fatigue and depression were a little better. Headaches -- not so much. Over the last year, at my behest, she has been receiving Botox injections every 3 months. She is better but the headaches are still killers. This means there are fewer trips to the ER and less days in bed. I talked her into trying hyperbaric. She went in despite claustrophobia. Only one day later, she felt miserable with a Herheimer, lasting 3 days. One week later she reported her headaches are better and she is very excited about continuing hyperbaric oxygen therapy believing this may be the final bullet in the war against her migraines. I am also hopeful that the combination of hyperbaric oxygen and low dose antibiotic therapy, which she is able to tolerate, will get treatment for her Lyme disease back on track as well. I will got on a limb; I think a short branch. Lone star ticks transmit Lyme disease. My patients have pointed this out to me for quite some time. We have to ask the question, what is Lyme disease? Willie Burgdorer discovered the famous spirochete granting him "medical immortality." The spirochete we associate with Lyme is Borrelia burgdorferi. Over the past few decades the Lyme epidemic has spread throughout the US and become global. But not all Lyme is the same. Our standard Lyme germ is designated strictly Lyme: B. burgdorferi (sensu strictu). Other forms of the bacteria causing Lyme disease(or something like it) are still called Borrelia burdoreri even if when they are a different species of Borellia. We do this by adding the suffice "sensu lato," meaning it is Lyme in a looser way. So bacteria with names like: B. garinii, B. afzelli, B. japonicum are called Borrelia burgdorferi (in the looser sense). Normally a bacteria is only allowed to have one species name. Scientists are particular about the way the group living organisms in a particular taxonomy. KINGDOM, PHYLUM, CLASS, ORDER, FAMILY, GENUS, SPECIES. Strains are variations within the same species. With Lyme disease, we have made an exception and attach an extra species name in honor of our friend Willie Burdorfer. Mainstream medicine informs that STARI or Master's disease, caused by the lone star tick is no cause for alarm because it is not Lyme disease. The particular bacterial cause of STARI has at times been elusive. But, some species of Borellia have been identified in STARI cases. The first was B. lonestari , currently not considered one of the Lyme sensu lata species. More recently two Lyme "sensu lato" species have been connected to STARI: B. adnersoni and B. americanum. So STARI can be Lyme even by the CDC definition. I think they need to update their website. The rash seen with STARI is more dramatic than that seen with standard Lyme is more like to cause the classic "bull's eye" appearance. In other words: STARI is more Lyme than Lyme -- at least with regards to the rash. Maybe STARI explains some sero-negative Lyme disease. STARI is said to be milder than Lyme. Are we sure? Anyway, it seems to me that B. lonestari should be part of the Lyme sensu lato family. But we are cautioned to avoid bites from the lone star ticks because this may lead to meat allergy. True. As Ixodes scapularis (deer tick) invades from the north and Amblyomma americanuum invades from the south, they both converge here, in the mid-Atlantic. It can be hard to tell the ticks apart. Adult female lone stars have a distinctive white spot on their backs. Nymphs cause most disease and are hard to tell apart. Lots of patients are testing positive for Rocky Mountain Spotted Fever. Patients universally have low positive titers. I do not think most have ever had the disease. There are many tick borne diseases yet unknown or undiscovered. A Rickettsia bacteria, unclassified, has been reported in a European species of Ixodes ricinus. This is a novel find. Rocky Mountain Spotted Fever (RMSF) is caused R. rickettsia. Patients have spots on their hands which spread to their trunk and these patients are frequently critically ill. Rickettsia species cause other diseases including typhus. RMSF is not known to be transmitted by small tick, deer ticks or lone start ticks, but transmitted by larger ticks like wood ticks/dog ticks. I think these positive results are due to cross-reactivity with some yet unknown form of Rickettsia carried by deer ticks. Some species of Rickettsia may cause little or no clinical illness. Low positive serology for RMSF may be another marker for the presence of tick borne illness in general. Like other tick-borne co-infections ( like Anaplasma) , Rickettsia species are all sensitive to doxycycline. For this reason, a course of doxycycline should always be incorporated in an antibiotic program used in the treatment of Lyme disease and tick borne illnesses.